Another bit of grammar for you and oooh, this one’s complex. We love a bit of complexity, don’t we? While older (and oldest – the rules for that are the same. Phew) has replaced elder in almost every circumstance, our language wouldn’t be English without an exception. I know. It’s confusing. If in doubt, use older – even if it’s wrong, the mistake is less likely to be noticed than misusing elder. 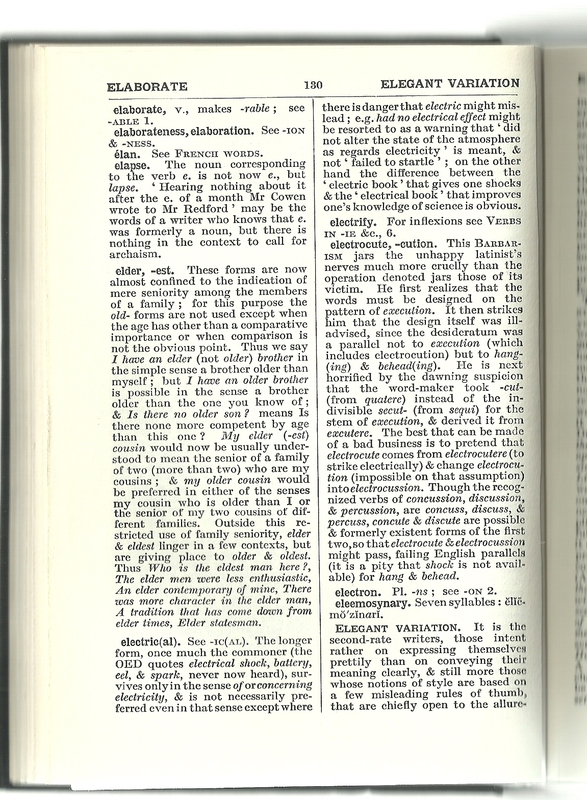 Or study the extract from Fowler’s Dictionary below, and think yourself lucky that at least younger doesn’t have the same issue. We all know the difference between Less and Fewer now, right? It’s all about things versus stuff, as I explained here. So what on earth is going on with the phrase, “One less thing to worry about”? And what about, “We’d gone less than 30 miles when we ran out of gas”? Well, it seems to depend who you ask. “One less thing” is definitely right; NOBODY says “one fewer thing”, but it’s up to you whether you say that’s because it’s just weird English language idiom, or because even with THINGS, one isn’t really countable in the same ways as bigger numbers, so “one less” is OK for THINGS as well as stuff. (Anyway, one less is never going to be stuff, because by definition you can’t have one stuff). “We went less than thirty miles” might mean 29 or 28 miles. Those things are countable, so I’d want FEWER than thirty of those THINGS we call miles. But realistically, it probably means 29.65234 miles, because miles aren’t discrete, so we’re really talking about distance, which is STUFF. “We went less far” would definitely be right. The same with “He owes me less than thirty pounds.” Fewer would just sound weird, because it individuates the pounds, where the issue is really the STUFF that is money. But explain it to yourself however you like, or just learn it as a rule, when you’re talking about measures, like money, weights and distances, less is sometimes more. Or fewer. There’s a difference between bringing and taking that I think has been lost to some of the people I talk to. And whilst I know that, like a lot of grammar issues, it’s not a big deal, it bugs me, so let’s clear things up if we can. Let’s say Andy is carrying a box to Bernard at Bernard’s house. If Bernard is involved in the conversation, whether he’s speaking or being spoken to, use BRING, because for Bernard, his house is HERE. If Bernard isn’t involved – say Andy is discussing the trip with his friend Charlie – use TAKE, because for everyone in the conversation, Bernard’s house is THERE. Tenses don’t change which verb to use, so obviously you might need to switch it to BRINGING or BROUGHT, TAKING or TOOK etc, but the rules above still apply. There is a complication to this basic rule – occasions when BRING is used in what looks at first glance like a TAKE situation. Actually, either is probably OK here, but one is more common. Let’s say Andy is talking to Charlie about the party at Bernard’s tonight. Even though neither of them is at Bernard’s house, they both will be. So although the house is currently THERE, it will be HERE at the time they are talking about. If either (or both) people are at the location in question at the time of discussion, use BRING. If both people in the discussion will be at the location in question at the time in question, use BRING. Well, here’s the trick. If you would use COME (or past tense, CAME), use BRING. If GO (or WENT) is more appropriate, use TAKE. When you spend approximately 7 hours on hold to a company in the space of a couple of days, you get to know their hold recordings pretty well. You also start going a little crazy and vowing never to use their service again (or writing humorous songs about your experience), but that’s by the by. I can tell you that if you are flying from Toronto Pearson with Air Canada, you can check in at the airport UP TO 45 minutes before the flight or online UP TO 24 hours before the flight. So far, so easy. But here’s the problem: those two uses of UP TO don’t mean the same thing. They don’t even mean similar things; they mean the complete opposite. Online check in opens 24 hours before the flight’s scheduled departure time. In-person check in closes 45 minutes before scheduled departure time. Are you with me? Let’s have an example. Flight AC848 departs YYZ 20:20 on 30 Jan. If I want to check in online, I can do that anything UP TO 24 hours in advance, ie any time between 20:20 on 29 Jan, and whenever it closes (this isn’t specified in the hold recording). If I want to check in in person at the airport, I can do that anytime UP TO 45 minutes before, so I need to arrive by 19:35 on 30 Jan. So what does UP TO mean and how can these both be right? UP TO means less than or equal to. With times, that means less than or equal to the amount of time stated. Online check-in is available LESS THAN OR EQUAL TO 24 hours before take-off. But with times it can be used to mean before the time of day stated. In-person check-in is available BEFORE [the time of day designated as] 45 minutes before take-off. Confused? I certainly am. In the law, we strive and strive to make contracts only interpretable one way, as writers we should do the same. So next time you use UP TO, especially referring to times, think if there is another possible meaning and if you could make yourself better understood by phrasing things differently. This is a confusion I tripped over a lot in the past. I think I’ve got it now, but let me know if you disagree. “Which” and “That” are used in a number of contexts, but the one I’m talking about is sentences like This is the house [which/that] Jack built. Sometimes, you can get away without using either word. This is the house Jack built isn’t wrong and saves you the bother of choosing between which and that. Also, if you’re talking about people, you should always use who (or whom). I saw a bumper sticker the other day – “Trucks for people that work hard”. This is either a very clever play on words (the trucks work hard) or it’s just plain wrong (if the people work hard, it should say who). But, back to the question of which or that. Microsoft Word has opinions – it gets upset if one types which without a comma in front. But adding a comma isn’t actually the whole answer. So, this is the house that Jack built. The second part is where the problem lay, because the implied repetition is pretty long: “gender was no more guarantee of temperament than [gender was guarantee of] appearance.” It works, though. The implied repetition is exact and there’s nothing else it could mean. Sure, it might be an unusual formulation for some readers and we might therefore avoid it if we prioritise clarity above everything, but we don’t have to and it’s not wrong. Which brings me to the title of this piece, and occasions where it is wrong or, at least, dangerous. The implied repetition intended by the writer is probably “We’d been sat in a booth and [we’d] eaten.” But my brain reads it differently. “We’d been sat in a booth and [we’d been] eaten.” Crikey, I’m thinking, I never saw that coming! The difficulty here is twofold. First, there’s an alternative way of reading the sentence (which is confusing) and second, there’s a switch from the passive voice to the active one. We should definitely use these implied repetitions in our writing. It’s hard not to – just look at how many times I’ve done it in this post. But be careful of them – try not to mix active / passive voice, tenses or singular to plural. Make sure the implied repetition is exact (I don’t like it when the implied repetition is a different part of the same verb, eg was to were) and when proof-reading, look for alternative readings that you didn’t intend! Believe it or not, I like new developments in English. That might come as a surprise to those who enjoy my Grammar posts, but it’s true. I post about grammar because I believe (and your feedback supports this belief) that many people want to know the “right” way of doing things and I was blessed with an education that taught me a lot about that. But just for a change, here are some of the wonderful “wrong” bits of English that pepper our lives, and that I love just as much as their anatomically correct siblings. The blessing, God be with you has been morphed by centuries of use until the original words are as forgotten as the meaning. In a hugely secular society, it’s probably safer that way and goodbye now has a host of meanings and connotations which make it a valuable part of our lives. There are many other examples of this too – which should make us more welcoming to the newest ones, like “imma” for “I’m going to”. Local dialects have been dying out ever since the invention of the horse and cart, but they remain in the details and add to the richness of our culture. Just look at the different terms of endearment used across Britain (mi duck, my lover, darlin’, chuck…). My friends and I enjoy trying out different dialects for fun – we mean nothing by it, and certainly don’t want to offend anyone. On a boating holiday in Yorkshire, one of them once bumped into a local who asked how the previous lock had been. “Eee, it were right grand,” said my friend, before realising his mistake and quickly ducking into the boat out of sight! Like any group of people who spend long enough in close quarters, my friends have also developed our own subset of slang. And a load of the boys in our group went to a British public school together, so they came with a ready-made language too. And then there are in-jokes and made-up words like Fictioneers or InMonsters. If you use these words out of context, people might look at you strangely, and like talking in your own language in front of foreign guests, there are plenty of times when it’s inappropriate, but shared language binds us. There’s a place for shorthand when you’re typing, and for showing those things that could be seen or heard in ordinary conversation but are missed in the written word. Until someone invents a sarcasm font and a few for other tones of voice too, the smiley will also remain a useful part of our written repertoire. And TTFN is really no different from Goodbye. What’s your favourite piece of “wrong” English?